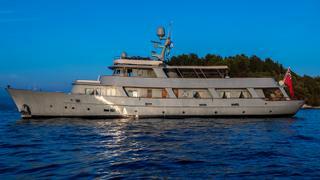 The classic canoe-stern 36.58 metre motor yacht Walanka has been listed for sale by Tomaso Polli at Edmiston & Company. Built in steel and aluminium by British yard Hall Russell to a design by John Wright, Walanka was delivered in 1963, benefitting from many refits since, totalling over €8 million over the past five years alone. Comfortable accommodation in an interior decorated throughout by Loro Piana, is for up to 12 guests in five cabins configured as a master suite, two doubles and two twins, each with a Pullman berth. All guest cabins have entertainment centres, television screens and en suite bathroom facilities while a further four cabins sleep seven crewmembers aboard this yacht for sale. Her large saloon has long, cream-upholstered settees to port and starboard and features an entertainment centre including a Loewe 65-inch plasma television screen and a stereo surround sound system. Outdoors, the aft deck comes with upholstered rattan chairs grouped around an oval table, offering the ideal al fresco location for morning coffees and evening cocktails. Upstairs, the long stretch of sun deck is perfect for social gatherings, with a lounging area to port and a dining area to starboard, each able to seat up to 12 guests. Her top speed is 11 knots and she boasts a maximum cruising range of 4,200 nautical miles at 10 knots with power coming from two 320hp Kelvin diesel engines. Lying in Monaco, Walanka is asking €3,950,000.